When a new piece of technology comes out, the price is generally so high that it keeps away everyone but the die hard early adopters. But with time the prices inch down enough that more people are willing to buy, which then drives the prices down even more, until eventually the economies of scale really kick in and the thing is so cheap that it’s almost an impulse buy. Linux SBCs, Blu-ray lasers, 3D printers; you name it and the hacker community has probably benefited from the fact that it’s not just the hacker community that’s interested anymore. Which is exactly what’s started to happen with laser rangefinders. Once almost exclusively a military technology, you can now pick a basic “laser tape measure” for less than $40 USD from the normal overseas suppliers. Unfortunately, as [iliasam] found, they aren’t particularly well suited other tasks. For one there’s no official way of getting the data out of the thing, but the other problem is that the sample rate is less than one per second. Believing the hardware itself was promising enough, he set out to reverse engineer and replace the firmware running on one of these cheap laser rangefinders (Google Translate from Russian). His blog post is an absolute wealth of information on how these devices operate, and a must read for anyone interested in reverse engineering. But the short version is that he figured out a way to reprogram the STM32F100C8T6 microcontroller used in the device, and develop his own firmware that addresses the usability concerns of this otherwise very promising gadget. 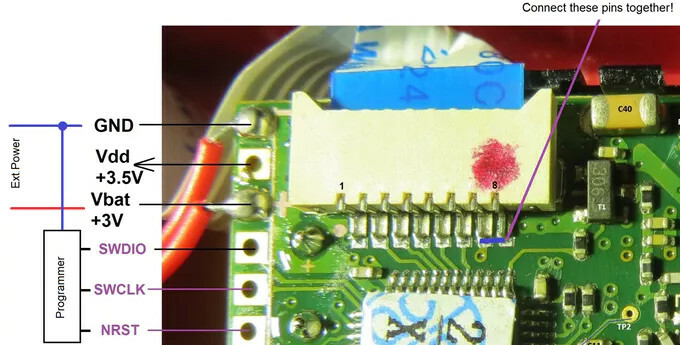 With some minor hoop jumping, the laser tape measure PCB can be hooked up to an ST-Link programmer, and the firmware provided by [iliasam] can be used to enable an easy to use serial interface. Perfect for pairing with an Arduino or Raspberry Pi to get fast and accurate range data without breaking the bank. It probably won’t surprise you to see this isn’t the first time [iliasam] has gotten down and dirty with a laser rangefinder. This extremely impressive build from last year allowed for incredibly accurate 3D scans of his room, and before that he created his own rangefinder from scratch. Sure we can have our kids back up against a wall, force them to stand up straight, and use a ruler on their head to mark their height on the wall, but what kind of hacker would we be? There isn’t a single microcontroller or any electronic component involved! The DIY-family that calls themselves [HomeMadeGarbage] stood tall and came up with a high-tech tool to measure their kid’s height. In place of the ruler they got a small wooden box to place on the head. Under the box, at the rear end facing down, they mounted a VL53L0X laser ranging sensor. With a range of 2 meters it’s sure to work with any child. But the box has to be sat level on the child’s head, otherwise the laser will be pointing down at an angle. To handle that they put an MPU6050 6-axis motion sensor in the box along with an Arduino Nano to tie it all together. A LCD display, measurement push-button and LED are mounted outside the box on the rear facing side. To use it, a parent sits the box on the child’s head, making sure the laser sensor isn’t blocked and can see the floor. The LCD shows the height, along with the acceleration in the x and y directions. The LED is red if the box isn’t level and green if it is. Holding the measurement button pressed puts the tool in measurement mode and when it’s level, the LED turns blue and the LCD display freezes so you can make a note of the height. You’re good for a while, depending on your child’s age. See it being used to measure a child after the break as well as an additional clip showing what the output looks like when waving a hand up and down below it. In Soviet Russia, DIY Laser Rangefinder Scan YOU!! Yakov Smirnoff used to say, “In America, you can always find a party. In Soviet Russia, Party finds YOU! !” Only here, it’s a laser rangefinder. 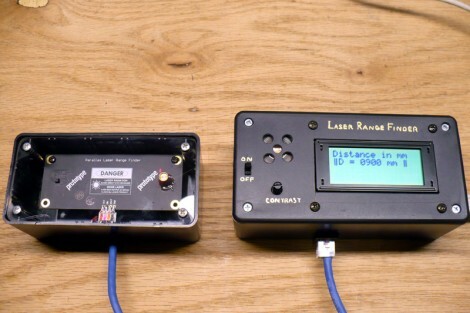 In this project (automatic translation), [iliasam] makes his own scanning laser rangefinder, like the ones that we’ve seen in fancy vacuum cleaners. But he does it from scratch. While this sort of thing is easy if you have a webcam and a ton of processing power to throw at it, [iliasam] takes the hard way out — measuring the parallax of the reflected spot through a lens on a linear image sensor (which renders as “photodetector line” in translated Russian). Linear image sensors are a lot like the elements in your CMOS digital camera, with the exception that the elements are arranged in a line instead of a plane, and they’re a lot easier to interface with a microcontroller. Hold a data line high to take an exposure, and then clock out the (analog) voltage values that correspond to the amount of light that hit each cell in the line array. While [iliasam] paid an estimated $18 for his, we’ve found them much cheaper on eBay. And there’s usually a linear sensor, often RGB and complete with driver circuitry, in a scanner if you take one apart. This could be done for just a few bucks if you were thrifty. Most police departments made a big switch from RADAR to LiDAR after consumers starting buying RADAR detectors. A lot of those LiDAR units are now out there on the surplus market. If you don’t have $500 or so to buy a LiDAR gun just to see what makes it tick, you are in luck. [Alexei Polkhanov] spent an hour tearing down a UltraLyte LTI 20-20 LR 100 so you don’t have to. An hour seems like a lot for a tear down video, but [Alexei] speeds up through the boring parts, and spends a lot of time talking about the optics and how the device works (with a lot of hand drawn diagrams). He also puts it back together and connects a scope to show the electronic operation of the device. He mentions the display and control board uses a serial interface to talk to the controller board. There is also an unpopulated header on the main board that is clearly a serial port, probably for reprogramming the onboard microcontroller. With a little reverse engineering work, this LiDAR gun ought to be highly hackable. In addition to the display and control board, the unit contains a high voltage supply for the laser and the photodiode. Making a power supply to drive the laser that is clean enough not to disturb the sensor is one of the design drivers and it shows. The power supply is a large and complex board by comparison to the other boards in the system. We’re changing it up this week with a reverse engineering fail which [Itay] pointed out to us. A couple of years ago [Nate] over at Sparkfun agreed to help a friend with a project that required precise distance measurement. He knew that laser rangefinders are a good way to go and mentions their use in golfing and the building trades. He picked up this handheld version billed as a laser tape measure. He put up a valiant effort to reverse engineer the PCB in hopes of finding a hook for the measurement data. Obviously his endeavor failed or we wouldn’t be talking about it in this column. But there’s a lot to learn about his methods, and a few of the comments associated with his original post help to shed light on a couple of extra things to try. We’ve got something of a love affair going on with quadcopters, but there’s still room for a little something on the side. 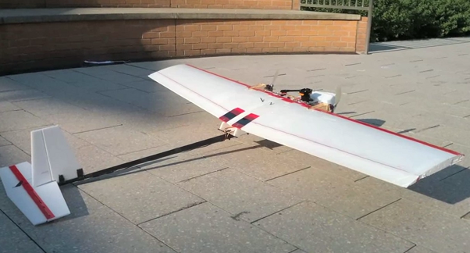 This fixed-wing drone can pull off some pretty amazing navigation. MIT’s Robust Robotics Group is showing off the work they’ve done with the plane, culminating in a death-defying flight through a parking garage (video after the break). This may not sound like a huge accomplishment, but consider that the wingspan is over two meters and repeated runs at the same circuit brought it within centimeters of clipping support columns. Unlike the precision quadcopters which depend on stationary high-speed cameras for feedback, this drone is self-contained. It does depend on starting out with a map of its environment, using this in conjunction with a laser rangefinder and inertial sensors to plot its route and adjust as necessary. We think the thing must have to plan a lot further ahead than a quadcopter since it lacks the ability to put on the brakes and hover. This is, however, one of the strengths of the design. Since it uses a fixed-wing approach it can stay in air much longer than a quadcopter with the same battery capacity. 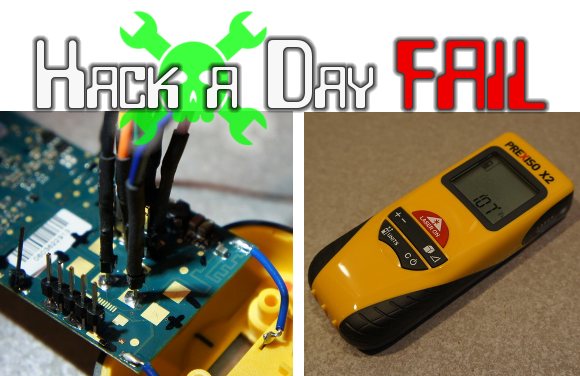 [Dino’s] project of the week is a backup alarm for your car. This is a feature that has become popular on many large vehicles like SUVs where visibility is an issue when moving in reverse. But it doesn’t sound like he was motivated by the need to have this in his own car. Instead, he was looking for something to build using a laser range finder. [Joe Grand] (the brains behind DEFCON badges) has been working on an inexpensive laser range finder for Parallax. He sent one of the first-run prototype boards to [Dino] for beta testing and we’re glad that [Dino] decided to show it off. It uses a small red laser diode and a camera module to measure distance in millimeters. The board communicates serially and this particular project uses an Arduino along with a character LCD and speaker to display distance and sound an alarm when the car is within a meter of an object. Check out the video after the break to see the build in its entirety. The system works reasonably well, if the object you’re about to hit is perfectly lined up with the laser dot.